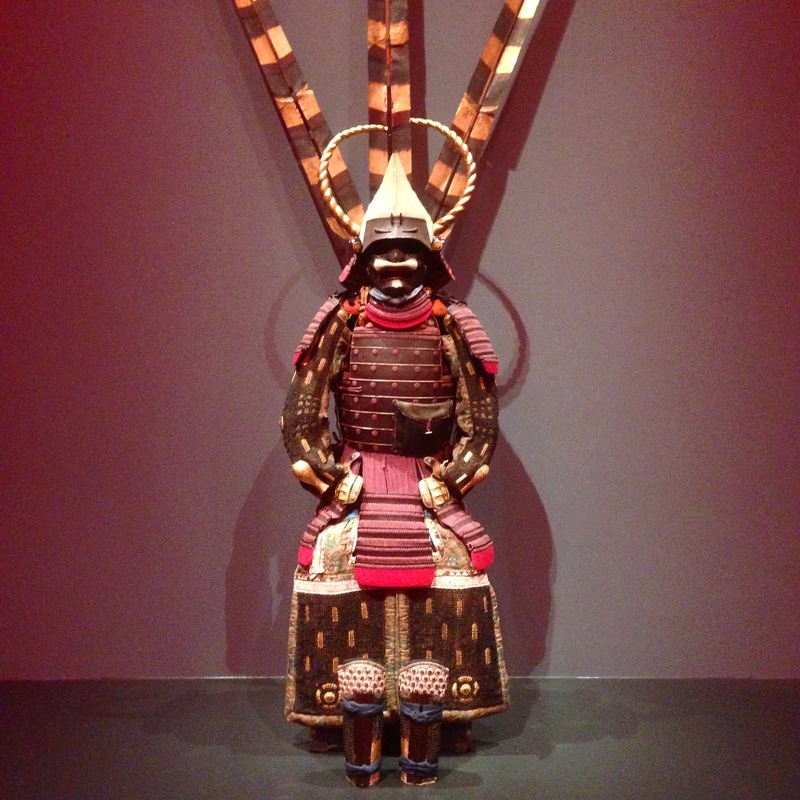 AWMA was fortunate enough to catch the Samurai exhibit in Los Angeles at LACMA. 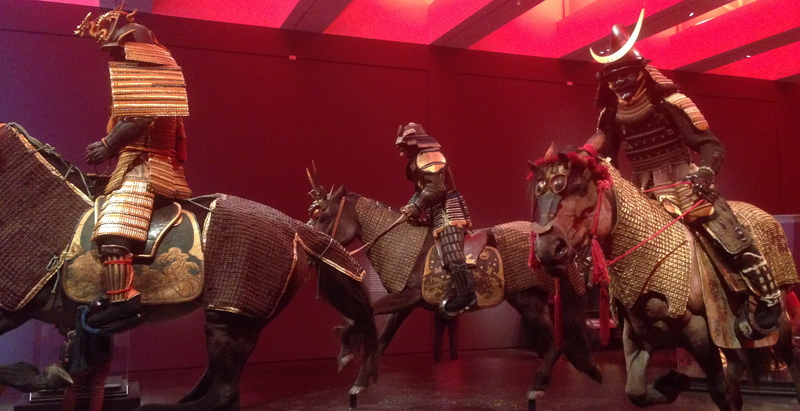 It was fascinating to catch a glimpse into the life, culture, and pageantry of these warriors from Japan. 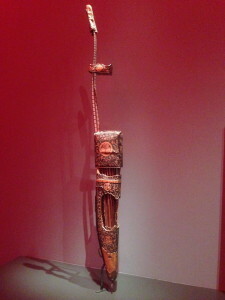 Below you can find an array of images from the exhibit that I found to be most interesting. 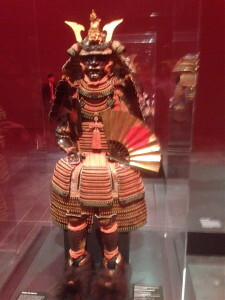 However, they will not do the warrior’s armor justice as the details and intricacy of each piece was too magnificent to capture with the camera I was using. Hope you enjoy and learn a little about the Samurai. 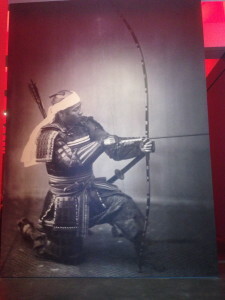 Very early on, the bow was associated with power in Japan. The first horse-mounted samurai warriors adopted the weapon and became expert archers. At the time, the term yumitori meant warrior. 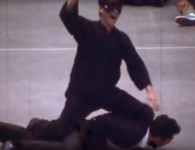 Archery eventually gave way to the use of firearms in combat, but the bow continued to be venerated, and archery remained a martial art that every samurai was expected to master. 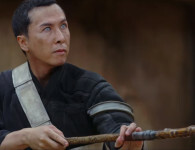 Traditional bamboo bows can be especially long and are suitable for use only on horseback. 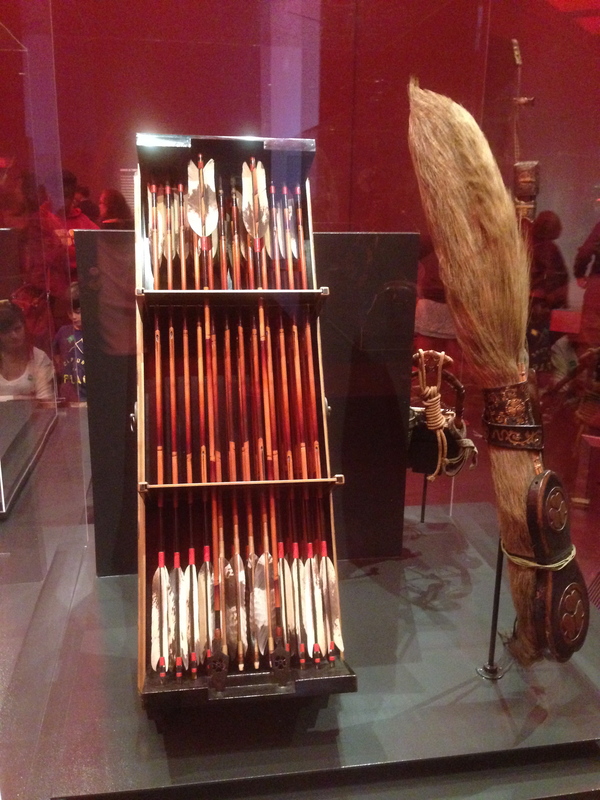 Designed for combat, arrowheads nevertheless were carved with elaborate motifs, and quivers (the storage cases for arrows) took different forms and were artistically embellished. 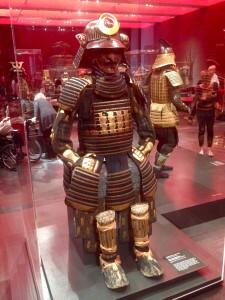 Samurai armor consists of a helmut (kabuto), mask (mengu), and chest armor (do) combined with shoulder guards, sleeves, a skirt, thigh protection, and shin guards. 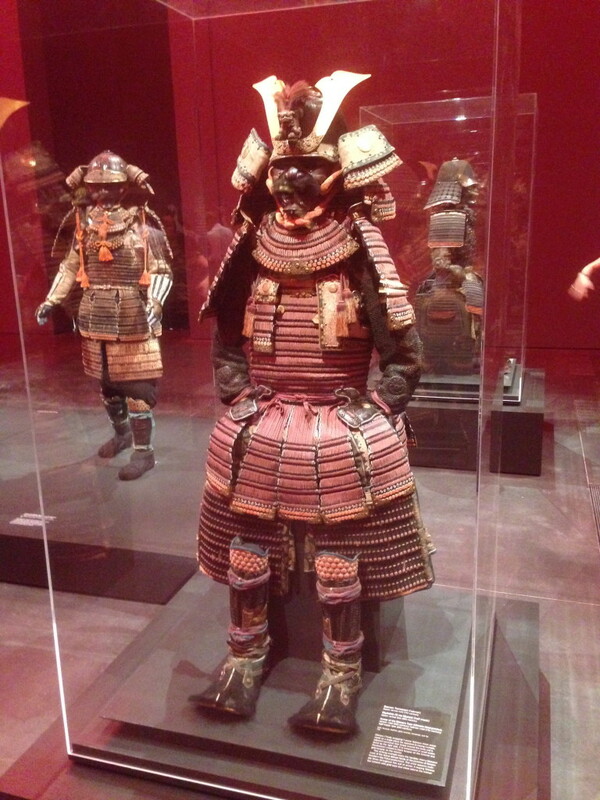 The armor, very light when compared to European or Persian armor, was made of small, perforated plates that were often lacquered and held together with colored lacing and silk cord. 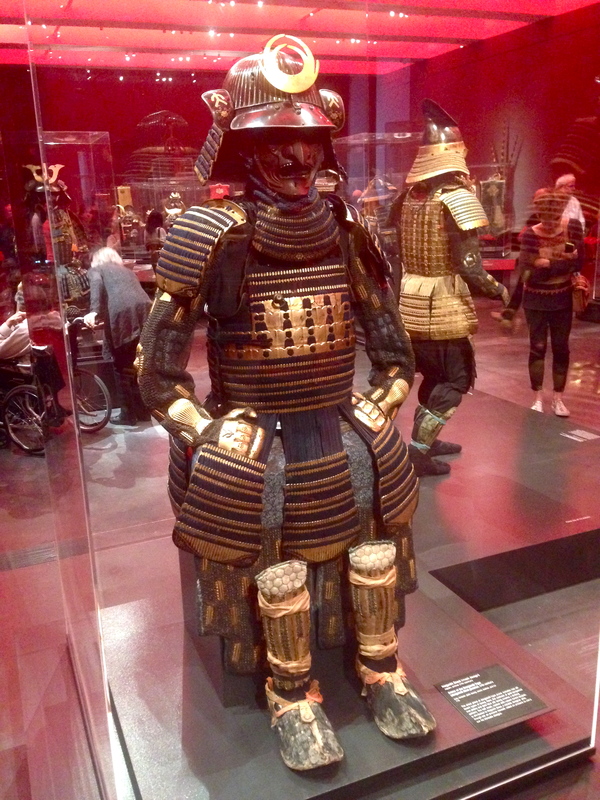 Many materials were required to produce a suit of Japanese armor that was as beautiful as it was functional. 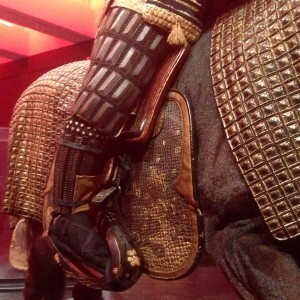 Iron, leather, brocade, and precious and semiprecious metals were often used. 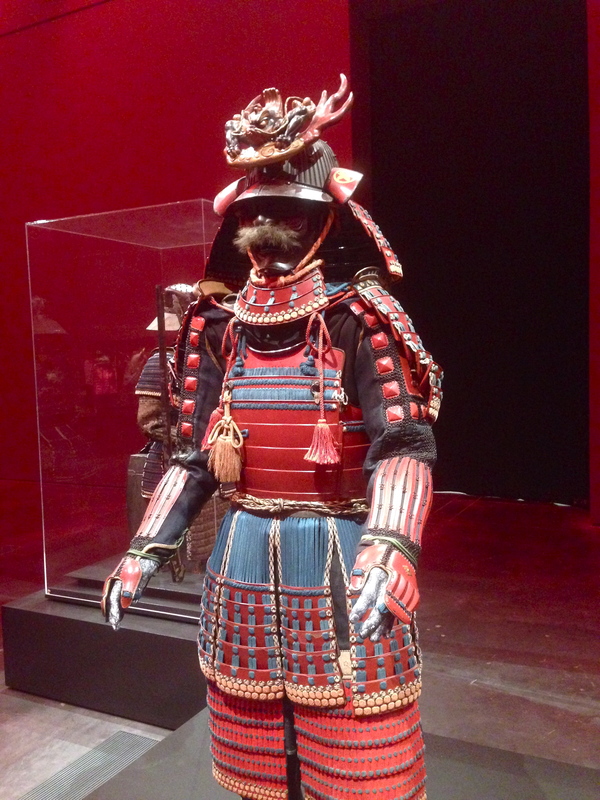 Several artisans worked for many months to create a single samurai suit of armor. 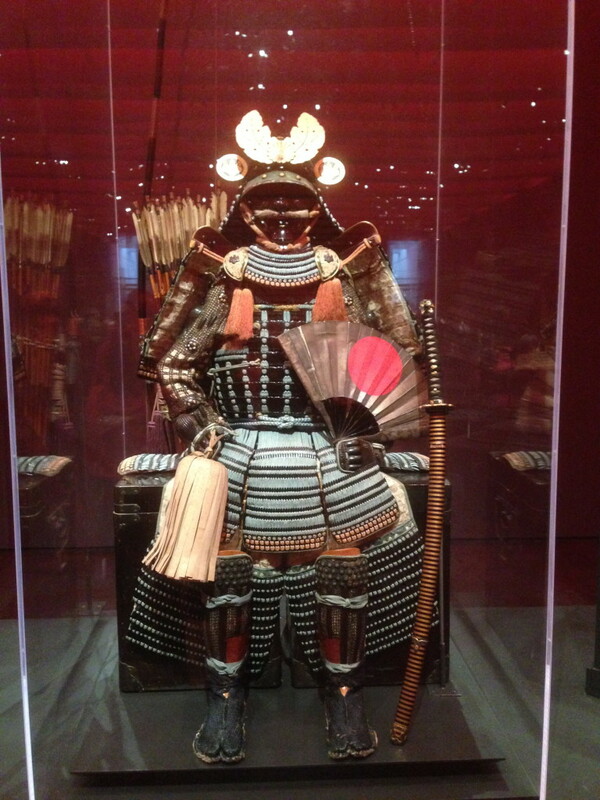 Armor of the Tatehagido type includes chest armor that is constructed of large vertically oriented iron plates. Here, the front plate is embellished with a gold kirin, a powerful mythical creature that is part dragon, part deer, and part horse. 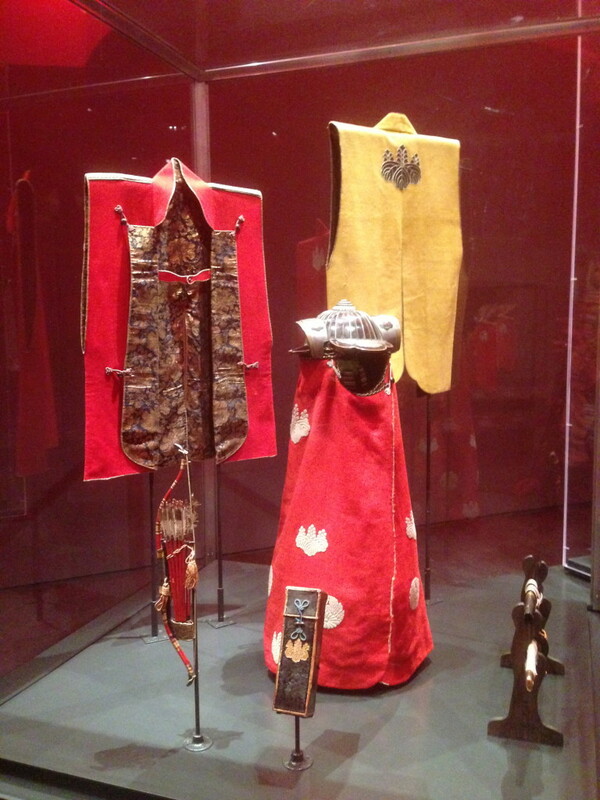 The small shoulder guards are in the shape of tortoise shells, symbols of longevity, and decorated with Chinese lions, protective beasts of Shinto and Buddhism, the principal religion of Japan. 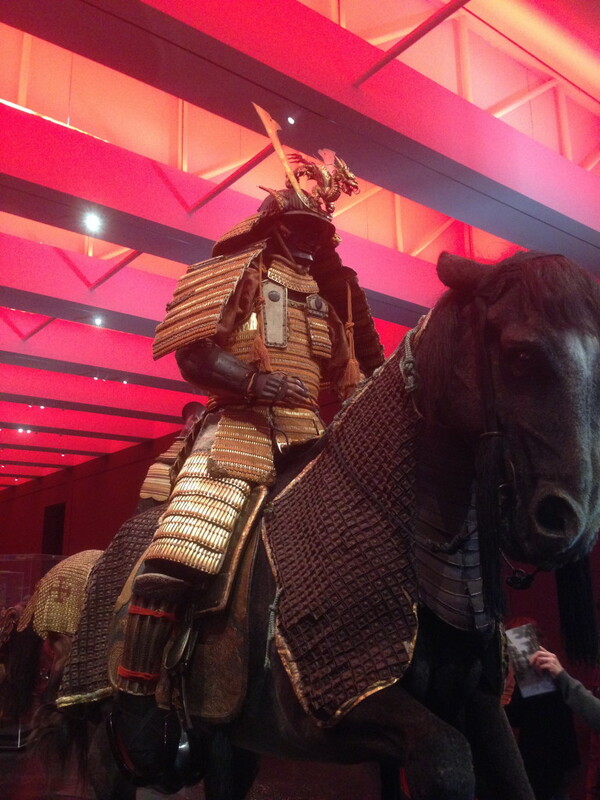 Horse armor developed during the Momoyama period, and it is possible that horses wore armor in battle by the early seventeenth century. This example is constructed from small leather squares coated in russet lacquer and sewn to a silk brocade lining. The saddle pads are adorned with a gilt design of plovers flying over a spray of waves,a traditional Japanese motif that signifies overcoming obstacles. Japanese armor is striking, refined, and highly functional. 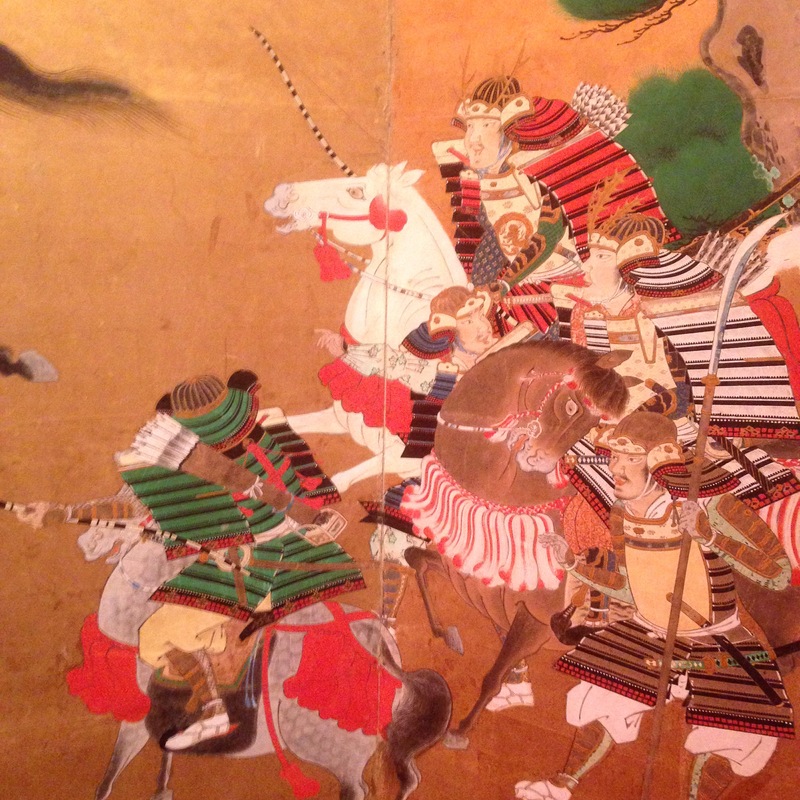 The techniques used by Japanese armorers to create the works throughout this exhibition evolved over centuries. Made for war, armor protected the samurai who wore it, and adorned and honored those who fought and died in combat. Later, in times of peace, such armor became a source of pride – a symbol of pomp and status in parades, ceremonies, and processions. 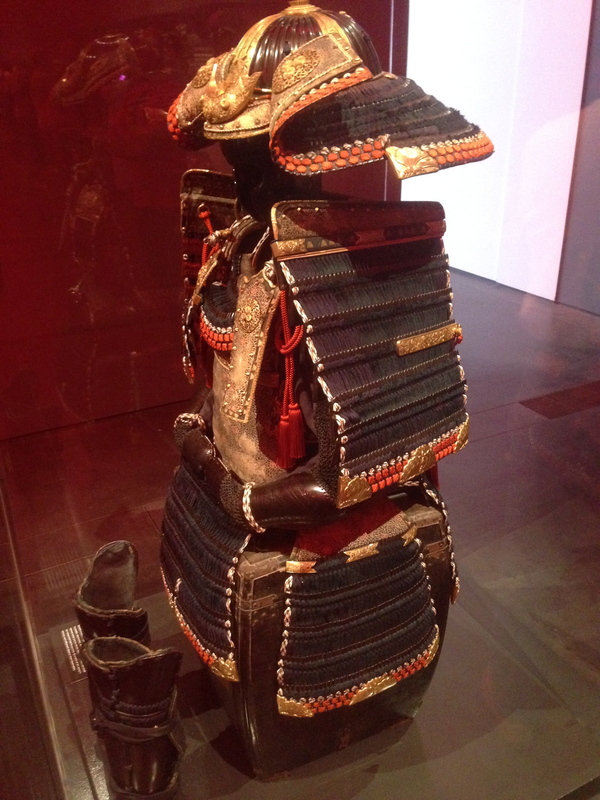 The power of samurai armor is in its details: functionally, even the smallest component has its purpose. As a work if art, armor’s intricacy and refinement deserve close observation. 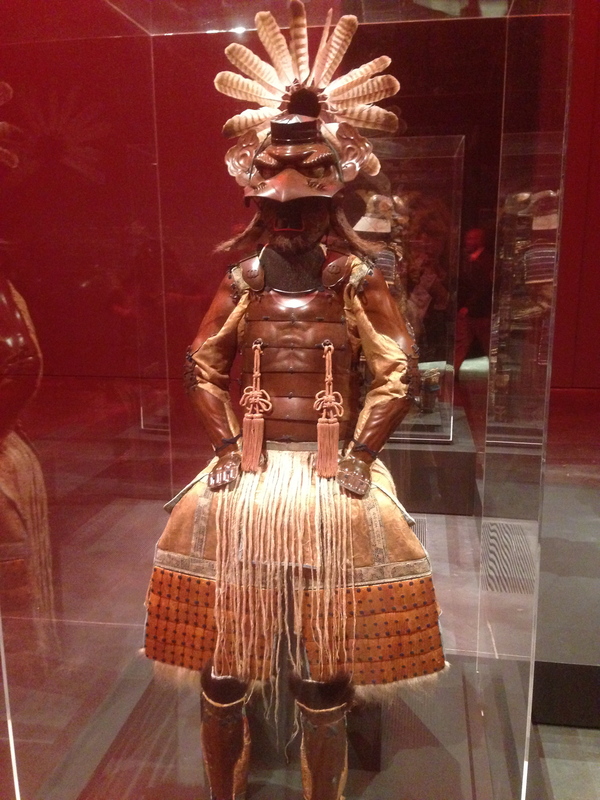 Oyoroi (“great armor”) features chest armor made in two parts, hinged on the left side and able to close on the right. 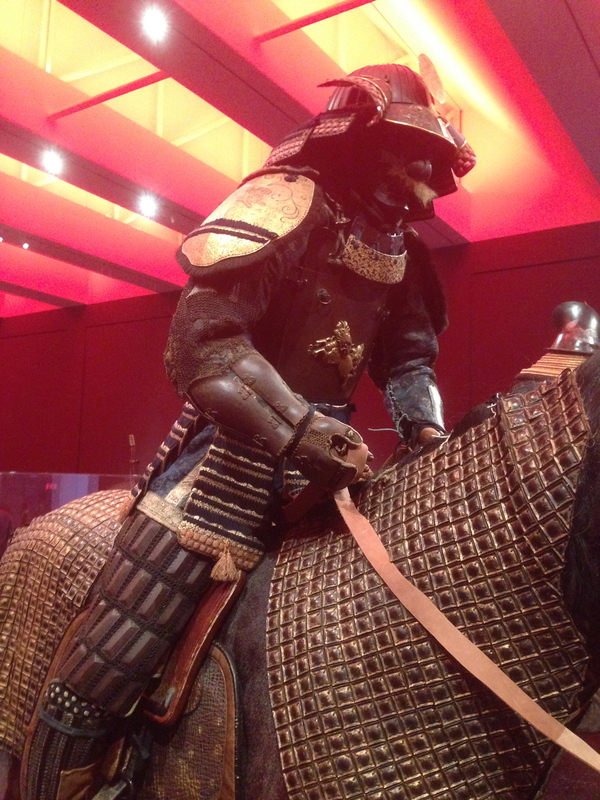 Worn by warriors on horseback. 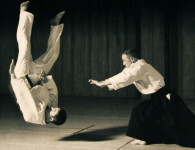 It reached its peak during the Kamakura period. 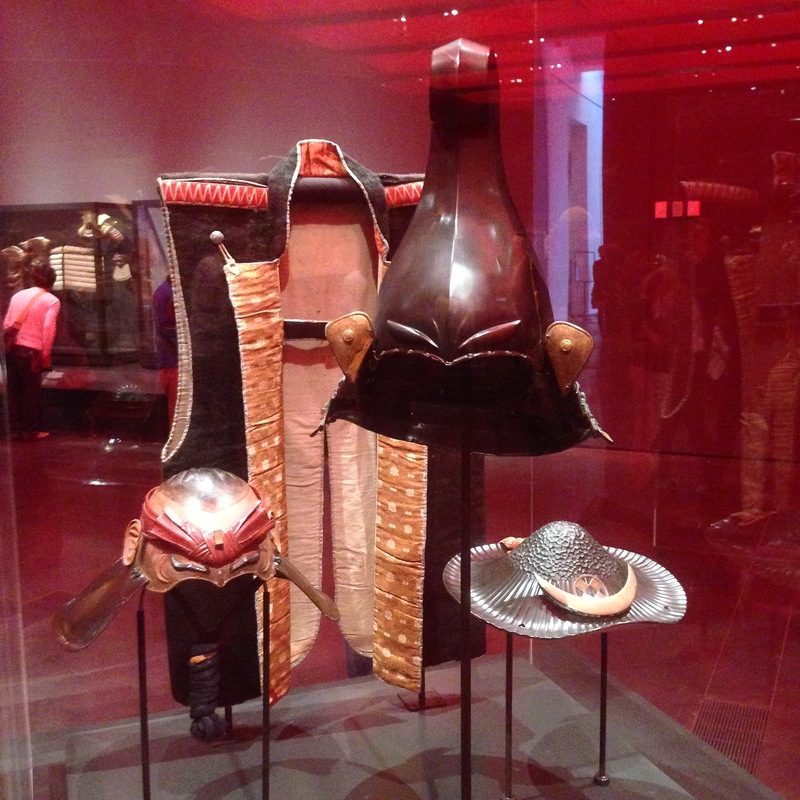 This set was made in the eighteenth century, when this revived style became popular with wealthier members of the samurai class. 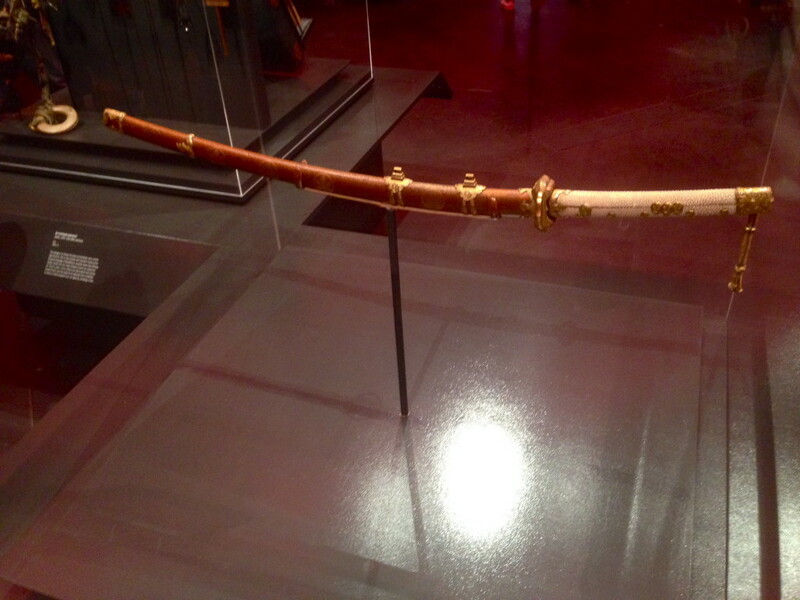 The traditional Japanese longbow measures between seven and eight feet long, with the grip one-third of the length from the base. Great skill was required in crafting the bow to ensure that the two unequal arms exerted an even pull on the arrow. This rare set includes a bow holder, two bows, and a particularly ornate quiver adorned with delicate gold-lacquer leafing. 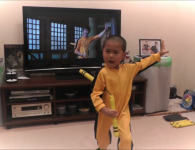 The ten bamboo arrows have forged-iron tips. All the pieces of this yumidai bear the crest of the Tokugawa family, the warrior clan that ruled Japan during the Edo period. 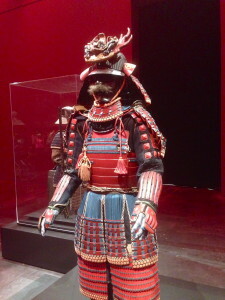 European army equipment influenced styles of Japanese armor, which had to be adapted to protect warriors against a new weapon introduced by the Portuguese in 1543: the matchlock gun. 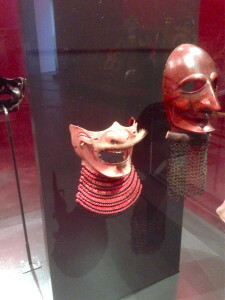 This half mask was lacquered in a pink tone to imitate the complexion of Europeans. The throat guard of this mask is made of chain mail attached to a strip of leather, a style inspired by European armor introduced in Japan toward the end of the sixteenth century. Though made in the Edo period, this helmet’s form is an ancient one, known as akodanari, or melon shape. The Ikeda family crest depicted on the turned back deflectors is that of a butterfly, an incarnation of the soul, framed in a square. This iron helmet resembles an eboshi, the male court headdress of the Heian period. The addition of yak hair, a rare item from Tibet, makes this example even more striking. Inspired by a helmet style that was introduced toward the end of the sixteenth century, this low, rounded helmet bowl resembles the shape of a human head, complete with flesh-toned lacquer for the skin, black lacquer for the hair eyebrows, and even detachable ears. The stylized headband (hachimaki), knotted on the forehead to absorb sweat, is a symbol of the samurai’s perseverance and endurance. The jingasa, a lightweight style of hat with a shallow bowl and wide brim, came into wide use in the late sixteenth century as headgear for foot soldiers. 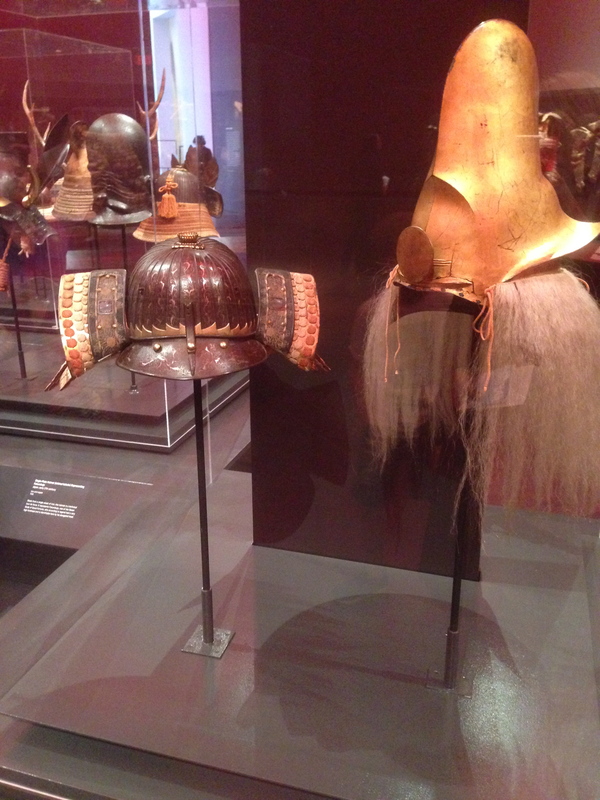 Commanders wore them when traveling, as they were more comfortable than regular helmets. 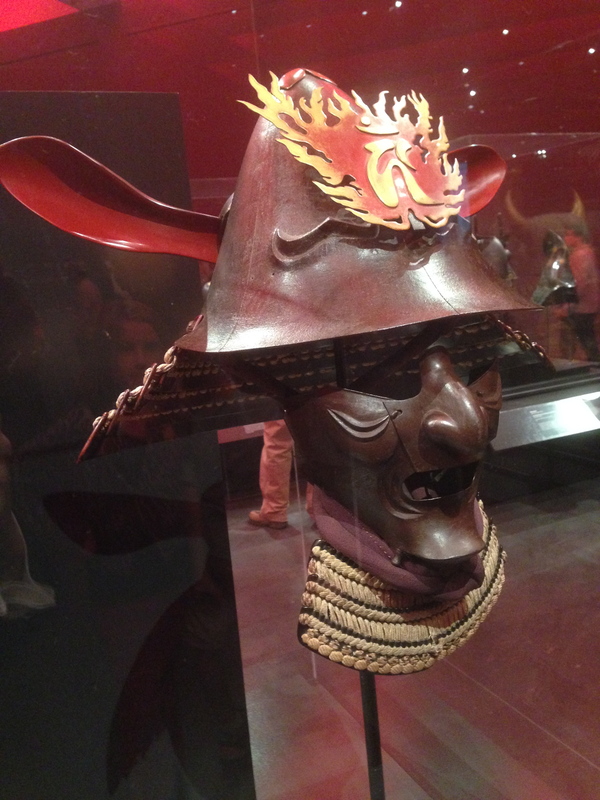 Meant to stand out on the battlefield, this helmet depicts a tall wave with a rounded crest, a frequent natural phenomenon in the Naruto Strait, which separates the Japanese islands of Honshu and Shikoku. 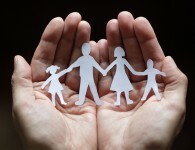 The family crest seen here is the manji, an ancient Sanskirt symbol that was adopted in Japanese Buddhism as a symbol of the university of the Buddha’s teachings. Domaru (body wrapping) armor features chest armor made as a single piece that wraps around the body and is laced up the right side. 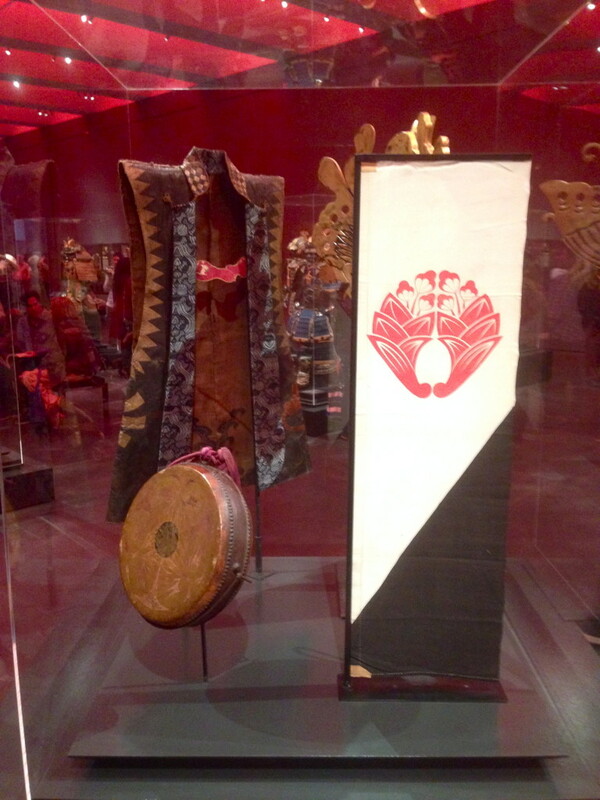 It is constructed of small scales coated in black lacquer on the exterior and gold lacquer on the interior. This striking example bears the heraldic cherry-blossom chest of the Arima daimyo family of the province of Echizen. This crest appears multiple times throughout this suit of armor. 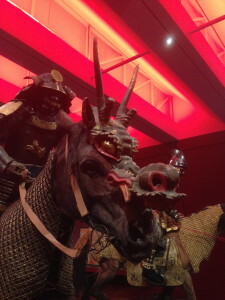 A leaping Chinese lion with gold eyes and claws adorns the helmet. Assembled from individual scales, domaru armor was easily custom-fitted to its owner. 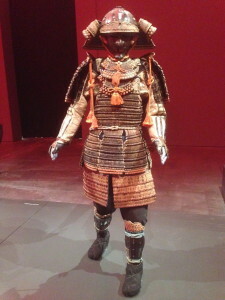 This chest plate is made of articulated scales laced with doeskin braids, and the plated helmet is adorned with shakudo arrows. 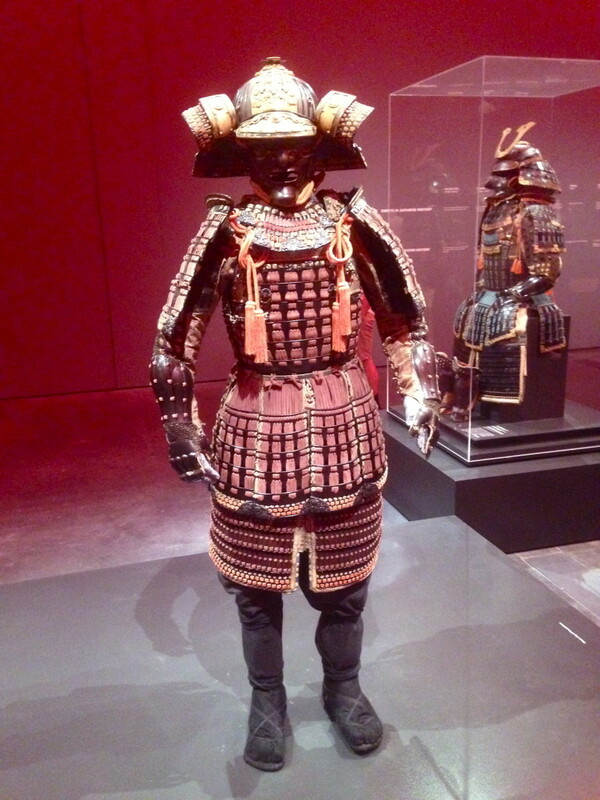 This armor bears the family crest of the Mizuno family of daimyo.